For the most part, the Tampa Bay Bucs have struggled enough when opposing quarterbacks play quarterback. They drop back, comfortable in the pocket. They slice and they dice, and the hardest thing is to figure out just which wide receiver is the most open. Most of them have had ridiculous quarterback ratings on their way to success. For the Bucs, Sunday's problem will be to corral Jackson, the slippery rookie out of Louisville. For the most part, quarterbacks this season have been content to take target practice at the Bucs. But Jackson has the element of young legs, which will present a different problem for Tampa Bay. In his four games, Jackson already has rushed for 336 yards, or at least 71 yards a game. Already, he leads the Ravens in rushing. Which means the ends must contain, and the linebackers must pay attention, or Jackson will be past them in a hurry. It's a problem the Bus haven't had much this year. As good as opposing quarterbacks have thrown the ball, they haven't cared much to run. The Bears' Mitch Trubisky is the only quarterback who has run for more than 50 yards against Tampa Bay (he had 53). Of the rest, nine quarterbacks have had 16 yards or less running. "Since Lamar’s gotten in that offense and got it rolling they’re averaging over 200 yards (rushing)," said defensive coordinator Mark Duffner. "I think the least they’ve had I think is 198 and I think they’ve had 265 as the most. They’re running the offense at a very productive rate right now and it’s a big, big challenge. It’s going to be 11-man football – as it always is – but you’’ve got a runner and a thrower with the capability of Lamar Jackson. It’s tough sledding. We’re working like heck getting ready for it. A running quarterback can make for a tough afternoon for a defense. It is an extra element to be concerned about. Remember the best days of Michael Vick and Steve Young and Fran Tarkenton? Yeah, like that. 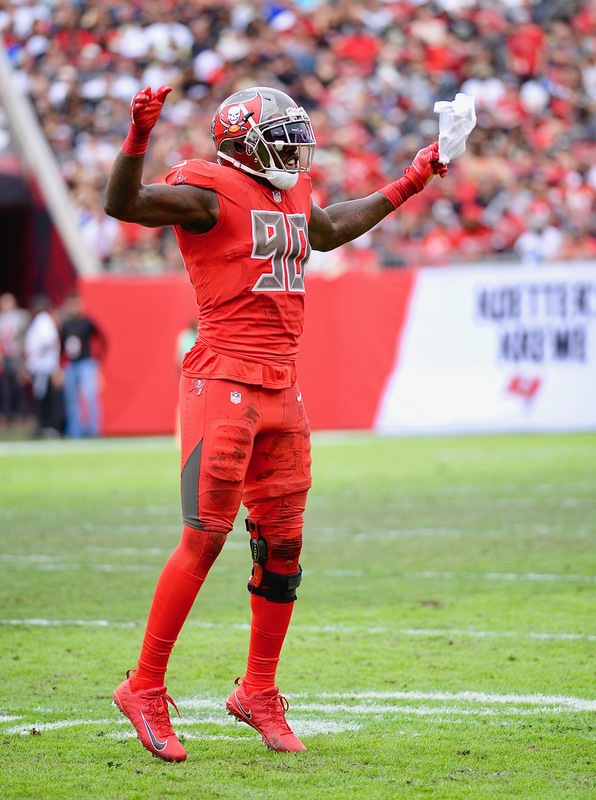 "Obviously, he’s a rookie and he just came in and he’s doing great things by being a starter now," Bucs' defensive end Jason Pierre-Paul said. "He’s a running quarterback and I know a lot about running quarterbacks because I’ve faced them a lot. I’m going to be looking forward to playing him. Looking forward to running out there and playing their option stuff. Historically, the best running quarterback the Bucs usually face is Carolina's Cam Newton. This year, Newton rushed for 33 yards in each of the two games against Tampa Bay -- less than half of what Jackson has averaged since becoming the starter. He's led the Ravens to three wins in his four starts. Still, Newton remains the guide for the Bucs' defense. In particular, that puts an emphasis on Pierre-Paul and Carl Nassib to contain. Then there is Pierre-Paul, who has been the best player on the Bucs' defesne. The Bucs play at Baltimore Sunday. Game time is 1 p.m.
Next post: Who has the edge when the Bucs play Jackson?